Well, dear reader, I caved. Unlike the usual stereotype, I’m more into shopping for good food than for clothes or new shoes (don’t get me wrong, though, they have their place in my life). Once a week, my boyfriend works slightly later than me. Although I should be taking full advantage of this opportunity to have the apartment to myself without thinking about someone else’s needs, fwooshing out second-hand cigarette smoke, etc., it almost always happens that I use the time to cook – or shop for food to later cook. 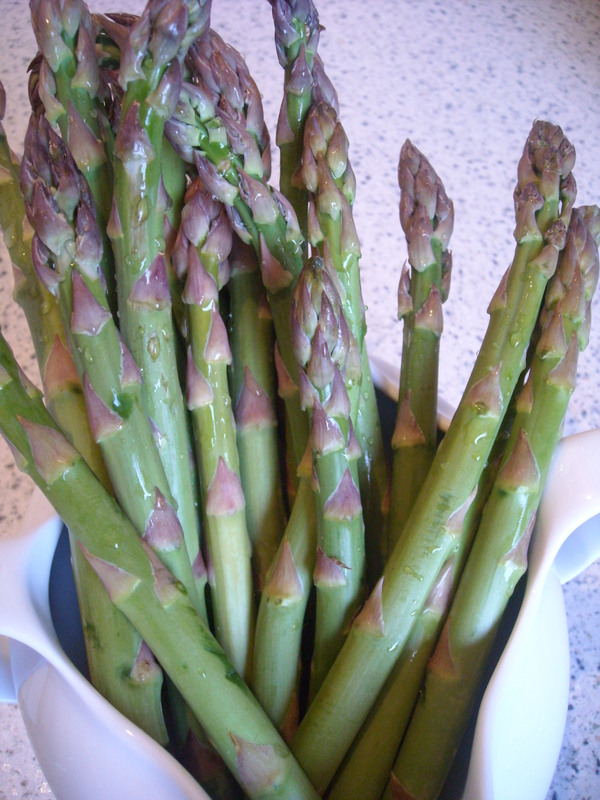 I’ve stopped myself a few times these the last few weeks from buying asparagus. “Don’t do it, it’s not German, it’s not local, it’s not in season yet, it’s too early,” etc. run the thoughts feverishly through my mind as I force myself to hold back and wait a few more weeks. Germans tend to be more into the thick white asparagus (spargel) than the green variety. Although I don’t mind it in soups, I’m far more partial to the latter, especially the tender, delectable baby green asparagus. My boyfriend, however, is not so fond of asparagus. “Why would I want to have stinky piss?” he invariably remarks with a grimace when I ask if he’d like to try something I’ve made with it. But, while the cats’ away the mice will play – or the cook will hit the kitchen. 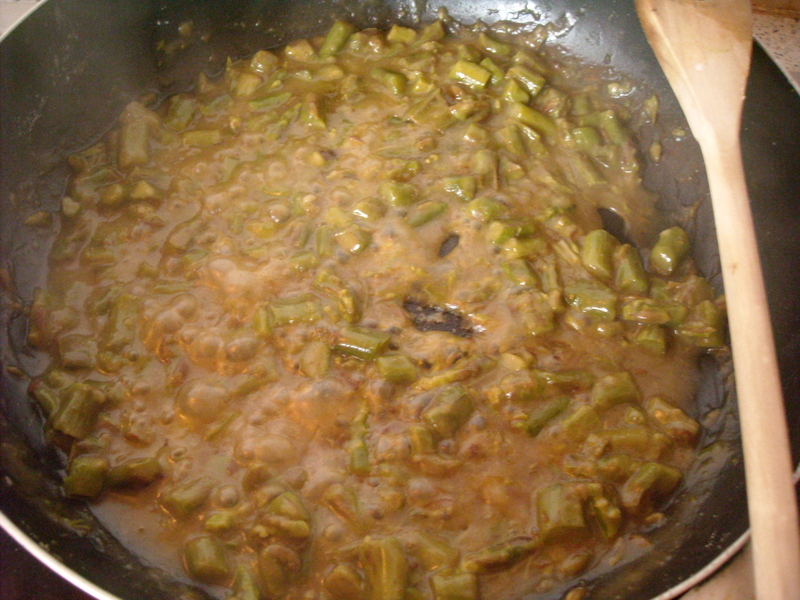 INGREDIENTS – 100 heads of asparagus, 2 oz. of butter, a small bunch of parsley, 2 or 3 green onions, flour, 1 lump of sugar, the yolks of 2 eggs, 4 tablespoonfuls of cream, salt. I guessed, since she calls them ‘Asparagus peas‘, that the size I was supposed to cut them to should be of a pea-like consistency. So, this is what I did. The recipe also calls for ‘green onions’. I was puzzled as to what that meant – young white onions, still somewhat green, or did this mean leek, spring onions / shallots? I opted for leek, as I had a rogue piece lolling about in the fridge, waiting for its turn to be transformed into something tasty. 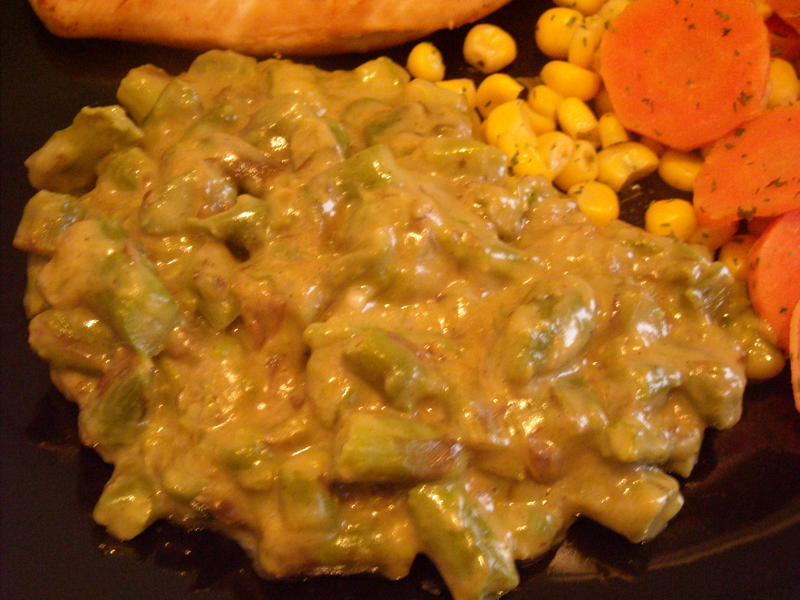 After the required 10 minutes of cooking the parsley, onion and asparagus in butter, the sauce requires a mere 15 minutes more to thicken and adhere to the asparagus, as it’s supposed to. 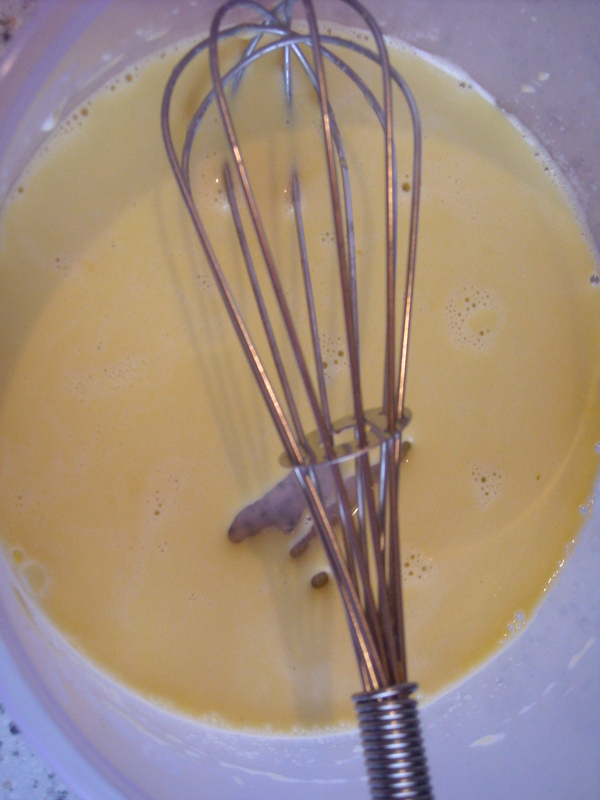 Then, once the egg yolk-cream mix is added, the ”peas” (although they were more than mushy by this stage) were ready to be served. I explained that I’d been busy keeping an eye on other parts of our dinner at the same time, hence the teeny weeny overcooking of the asparagus. Next time, I’ll plan ahead a little more to avoid such an outcome. As for me, I also agree this is a pretty nice side dish. Wonderfully mild and creamy. This entry was posted on April 14, 2010 at 8:20 pm and is filed under food. You can follow any responses to this entry through the RSS 2.0 feed. You can leave a response, or trackback from your own site.